The program will take place in Chicago. Physicians preparing for (re)certification in nuclear cardiology, or physicians interested in a broad review in nuclear cardiology topics are encouraged to attend. 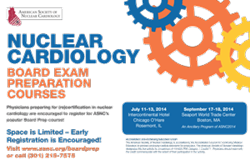 The American Society of Nuclear Cardiology (ASNC) will be offering a Nuclear Cardiology Board Exam Preparation Course from July 11-13 at the Intercontinental Hotel Chicago O'hare in Rosemont, IL. The goal of this board review course is to prepare participants for the certification and re-certification exam in nuclear cardiology. The program will increase attendees knowledge and competence to treat patients with the appropriate cardiac nuclear imaging procedures. This educational event is designed for physicians preparing for the certification or re-certification exam in nuclear cardiology, as well as physicians interested in a broad review in nuclear cardiology topics. The course is designed as an interactive format with panel discussions with renowned nuclear cardiology faculty. For more information please visit http://www.asnc.org/boardprep. The American Society of Nuclear Cardiology is the leader in education, advocacy, and quality in cardiovascular imaging, with more than 4,500 members worldwide. ASNC provides its members with a variety of continuing education programs related to nuclear cardiology and cardiovascular computed tomography (CT), promotes accreditation and certification in nuclear cardiology, establishes standards and guidelines for training and practice, and serves as a representative in health policy and the principal advocacy voice for professionals in the field. To visit the website, visit: http://www.asnc.org. Intercontinental Hotel, Chicago O'hare in Rosemont, IL.